THE ROUND Cup matches between Tupapa Maraerenga and Nikao Sokattak; Puaikura and Titikaveka were called off following heavy rain on Saturday around Rarotonga. Torrential rainfall across the island led to extreme flooding around the host pitches, which forced the decision on safety and security grounds. There had been heavy rain in the hours leading up to the matches and match officials inspected the sodden playing surfaces prior to kick off times. Puaikura and Titikaveka matches were immediately postponed, while the decision to continue on with the Tupapa Maraerenga and Nikao Sokattak games persisted with a change of venue. The Takitumu school field was still in playable condition and resulted in a neutral ground clash for both Tupapa and Nikao. 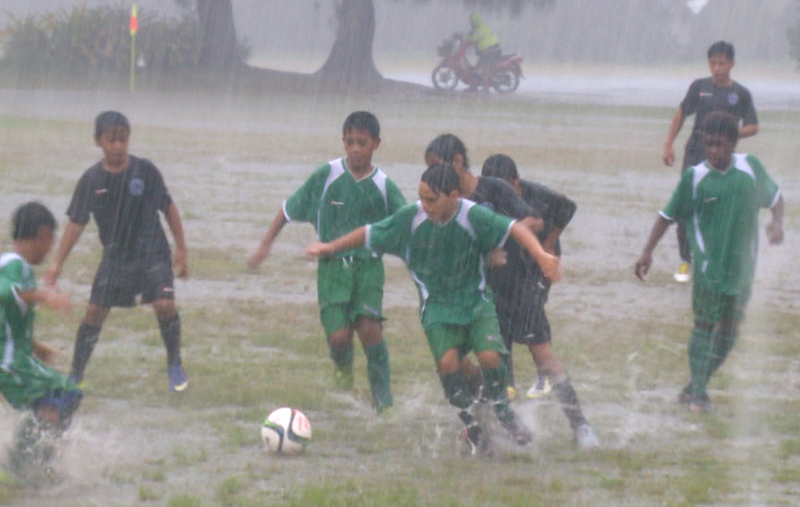 The Bank of the South Pacific Under 14 Girls and U-14 Boys took field for their final round games and while the conditions were unfavourable it made for some very slippery and exciting football. But as the U14 Boys’ match neared the end of its time, the heavy downpour continued to fill out the pitch making it very difficult to continue play and a sudden decision to call off the senior women and premier men’s games was made following the full-time whistle. These games will be played in the coming week with fixtures yet to be confirmed. Meanwhile, Avatiu and Matavera missed the rain to play their mid-week clashes on Thursday and Friday. The Matavera U-14 Boys team proved too strong for their hosts with an 11-0 defeat, but a tough encounter between their U-14 girls teams saw Avatiu manage a slim 1-0 victory over the visiting side. In the premier men’s clash, Avatiu wasn’t going to let the visitors take home victory and put two goals in the back of the net to win against Matavera. This leaves Matavera at the bottom of the Van’s premier men’s table and the team is bound to face a tough knockout collision at the end of this week. Under 8 Mixed 1-0, Under 11 Mixed 0-2, Under 14 Girls1-0, Under 14 Boys 0-11, Under 17 Men 4-1. Under 8 Mixed 1-4, Under 11 Mixed 2-0, Under 17 Men 3-1. Under 8 Mixed 2-0, Under 11 Mixed 1-1, Under 14 Girls 5-0, Under 14 Boys 1-1.